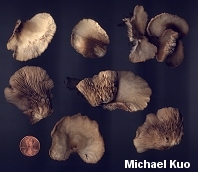 This mushroom is superficially similar to the oyster mushroom, Pleurotus ostreatus, but it is smaller and has a brown spore print; the oyster mushroom has a white to pale lilac print. 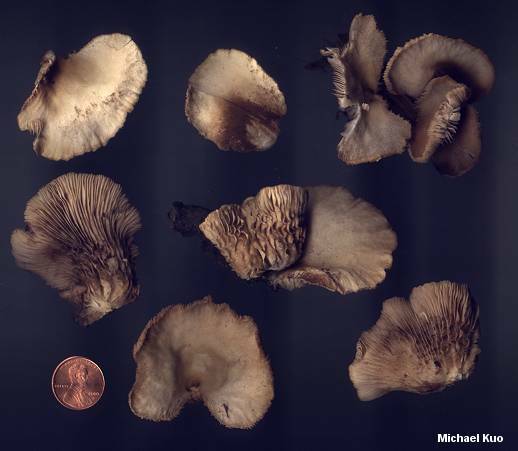 Among other species of Crepidotus, Crepidotus applanatus can be recognized by its smooth to finely velvety, whitish cap; its fairly crowded gills, which radiate from the point of attachment; and microscopic features (see below). 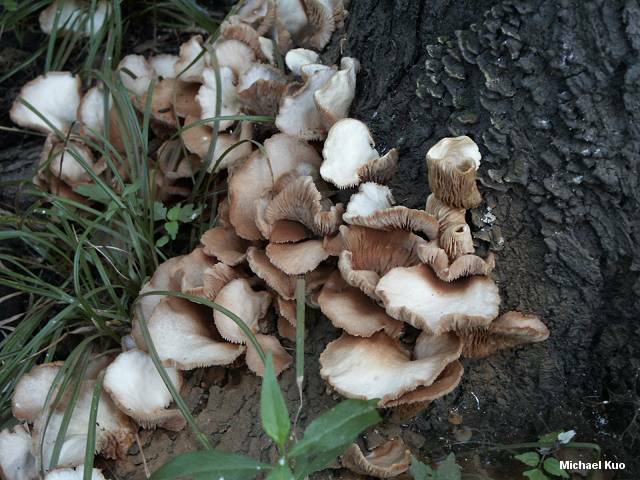 Ecology: Saprobic; growing gregariously or (more commonly) in overlapping clusters on dead hardwood stumps and logs; summer and fall; widely distributed in North America. Cap: 1-4 cm; shell-shaped or petal-shaped; somewhat flabby; smooth or finely velvety (towards the point of attachment) in all stages of development; the margin often slightly lined; white, becoming brownish to pale cinnamon brown; hygrophanous. Gills: Close or crowded; whitish, becoming brownish in maturity. Stem: Absent. Rarely, when conditions force the mushroom to grow straight upwards rather than in a shelf-like position, the cap may be nearly circular, creating the illusion of a rudimentary "stem" where the mushroom attaches to the wood. 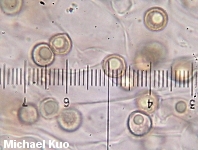 Microscopic Features: Spores 4-6 µ; globose; very finely punctate or roughened (often hard to discern even with oil immersion). Pleurocystidia absent. Cheilocystidia variously shaped; up to 50 x 12 µ. Pileipellis a cutis with occasional erect elements. Clamp connections present. REFERENCES: (Persoon, 1796) Kummer, 1871. (Saccardo, 1887; Kauffman, 1918; Hesler & Smith, 1965; Phillips, 1991/2005; Lincoff, 1992; Barron, 1999; McNeil, 2006; Miller & Miller, 2006.) Herb. Kuo 08010203.